greatest Warriors and mages that Animalia has produced. Her strength, determination, courage, and her will will all be tested. But so will her heart. 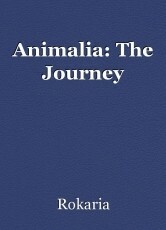 This chapter simply explains the world and introduces a loose plot, as well as introducing the protagonist. again, but certainly not in every chapter. Please let me know if this is a breaking some sort of guideline or rule, I couldn't find anything about it in the FAQ. This chapter sees our protagonist embarking on her journey after a lively breakfast with her knights. Second version because, upon having a friend read it, a lot of errors were found. Many were corrected.